Sharpen your skills. Get fresh ideas. Explore new cuisines. 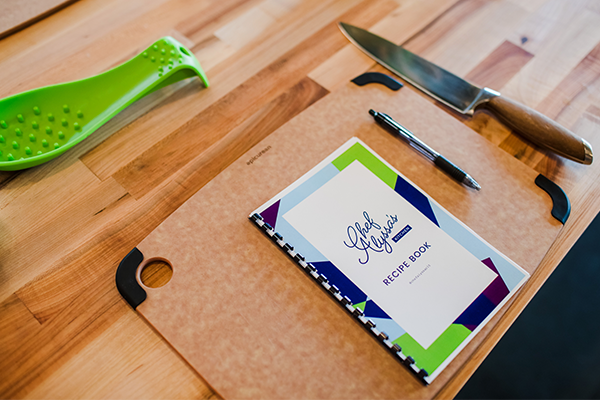 There’s a class on the schedule for you here at Chef Alyssa’s, no matter what brings you to our kitchen. Regardless, it will be a memorable experience! We offer classes at five different ability levels. Selecting one that is aligned to your current skill level gives you the best chance at improving upon those skills (and enjoying yourself). Our classes accommodate up to 24 participants. Reservations are first come, first serve—and classes fill up fast. You can be added to a waitlist for classes that are already full. We release new classes each month on our newsletter. Add your e-mail address at the bottom of this page to make sure you’re on the list. Classes are designed around fresh, seasonal ingredients. We might use fresh tomatoes in the summer but not in the winter and you won’t see too much butternut squash in July. You’re welcome to bring your own wine or beer to enjoy responsibly. 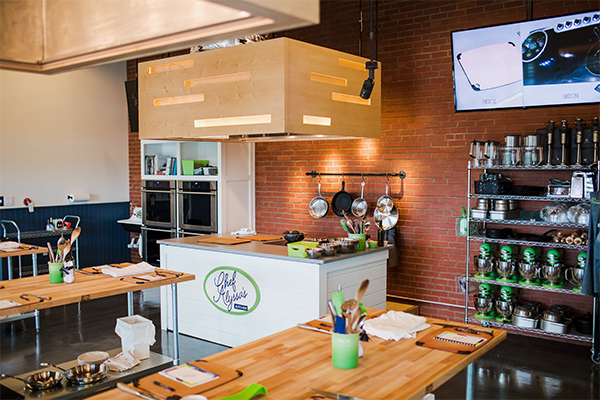 Our cooking classes make great gifts. We can also organize special classes for private parties and company outings. Still have a question? We’ve probably got it covered in our FAQs. Selecting a class aligned to your current skill level gives you the best chance at improving upon those skills. Keep in mind that the skill level we have assigned to each class is also an indication of pace. If you’re an experienced cook, we promise you’ll still pick up something new, whether that be a different technique, a timesaving trick, or a shopping tip. Not sure where you land? Take our Onion Test. We separate each class by difficulty level so that our students can pick the best possible class for their skill level. Click to learn more about each difficulty level as well as find out which classes are best suited for your skillset! I have no idea where to start and my attempt may result in tears. So you’re not quite a beginner, but you’re not necessarily at home in the kitchen, either. This level goes a step above the basics; you’ll develop your current skills and learn how to correct common errors in technique. You’ll pick up some new skills, too, along with seasoning tips and a few recipes to try at home. I’ve cut a few onions. Probably never the same way twice. If you feel pretty comfortable in the kitchen and are ready to enhance your abilities or expand your culinary horizons, this is your level. 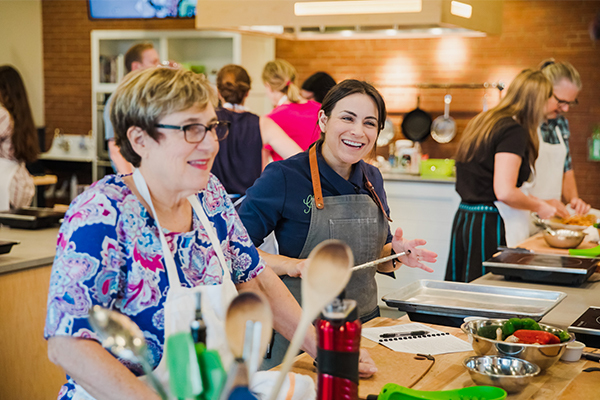 In these classes, you’ll hone your skills, learn to plate dishes artfully, and figure out ways to tweak recipes. You may also discover altogether new dishes to enjoy. I’ve cut onions before. It’s not that difficult. You watch all the cooking shows, you scour recipes online and in cookbooks, and you’re always looking for the next hot thing to try. We’re guessing you’ve hosted a dinner party or two in the past year, and you probably did all of the cooking. At this level, you’ll learn how to prepare great dishes that are a little more complex, plus get advice on how to save time or work smarter. Cutting onions? No sweat. What else can we do? Not only do you enjoy cooking, you’re really good at it. You’ve probably been in the kitchen for a long time now. You’ve hosted your fair share of dinner parties, you’re always the cook, and everyone looks forward to what you’re making for the Super Bowl party. We promise to still throw a challenge or two your way and (hopefully) teach you some new tricks. What size dice? I got you, Chef Alyssa.